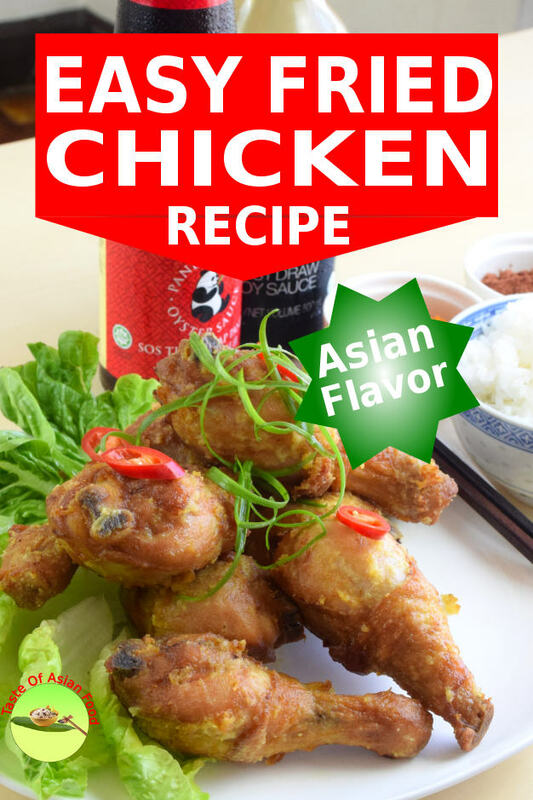 This easy fried chicken recipe is adapted from the cookbook written by a respectable Chinese chef Mr. Pang Wah who was the executive chef of a top Chinese restaurant in Kuala Lumpur in the seventies. His combination of Chinese five spices and curry powder for fried chicken was an unprecedented attempt. 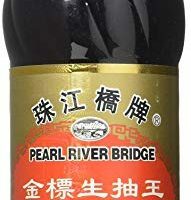 The result is the epitome of the Chinese and Malaysian culinary uniqueness, which blends harmoniously. It is unfortunate that there is hardly anyone making this dish anymore after he retired. My first impression of using Chinese five-spice powder and curry powder together was that they are not compatible. Chinese fried chicken never contain curry powder, and five spices powder is never included in any Malays and Indians recipes. But the result is exceptional. This is one of the best fried chicken recipes I have tested. 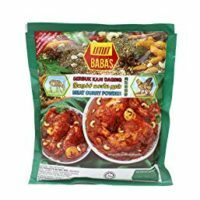 Both spice powders are working in harmony, resulting in a new flavor the is not in any Chinese and Malay cuisine. I am sure it will be an instant hit if any restaurant decided to promote this dish.! I have created this easy chicken recipe based on his work, and using more flour for the coating to make it crispy. The result is the fried chicken that stays crunchy, with a myriad of Asian spices hitting your palate every bites you take on. This easy fried chicken with curry and five spice powder recipe is one of the easiest I ever published. It is an ideal recipe for a great meal with minimum preparation. All you need is to check your kitchen pantry to find out what you have, and head over to the market to get the chicken, plus some other spices that you need. It takes less than twenty minutes of active preparation and cooking time. There is marinating time though which is the passive waiting time. The best result is to marinate overnight in the refrigerator. However, if your guest tells you that he could eat a horse, you better marinate it for only an hour which is the bare minimum time required. It takes only three steps to prepare this fried chicken. Clean the chicken pieces and draining away the water or pat dry, as part of the seasonings are in the liquid form. It is not good to have too much water in the marinade, which dilutes the flavor. Combine all the ingredients of the marinade – beaten egg, ginger juice, Shaoxing wine, light soy sauce, oyster sauce, sugar, salt, five-spice powder, curry powder, and cornflour. Mix well with the chicken. Let it marinate for at least one hour or better overnight if time is allowed. Most of these ingredients can be found in the pantry of the Asian kitchen. 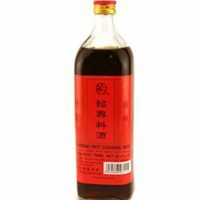 Chinese households and other Asian food lovers usually have light soy sauce, oyster sauce, sesame oil and Chinese five spice powder available at any time. To prepare the ginger juice, cut the ginger into small pieces and smash it with the blade of the knife. Mince the ginger finely and put it into a cloth bag to squeeze out the juice. 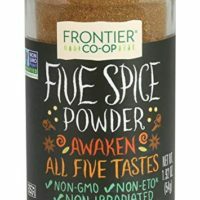 Chinese five spices powder is a combination of cloves, cinnamon, star anise, black pepper, and fennel. 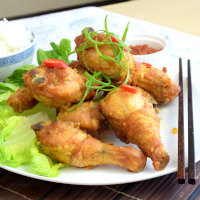 We use to make Chinese five spice chicken wings without the curry powder, but they do not taste as good as this recipe. Most of the Chinese households do not prepare it from scratch as it is readily available commercially. There are plenty of brands to choose from at where I live, with different manufacturers taking their spin on the variation of the spices. I am using the curry powder made in Malaysia. You can have a choice to use other brands. I can assure you that this fried chicken is not hot and spicy, as the amount of curry powder is just enough to accentuate the flavor, with no intention to create a fiercely hot dish. While we are marinating the chicken, prepare the coating ingredients of this easy fried chicken. I am using the same coating formula as in my General Tso’s Chicken for this Asian fried chicken recipe. I also include 1/2 teaspoon of salt, 1/2 teaspoons of curry powder and 1/2 teaspoon of five-spice powder to be in line with the flavor of the marinade. Combine all the powders and set aside. We use an electric deep fryer in the restaurant for a large batch of chicken. It is handy in the restaurant because it has the in-built timer and thermostat. 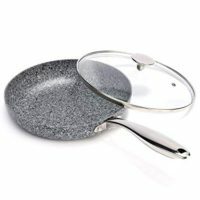 However, it is not practical for home cooks who only deep fried foodstuffs occasionally. 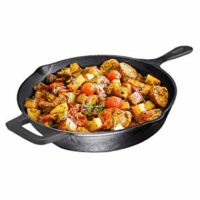 For the smaller quantity when cooking at home, it is more practical to deep-fried with a pan or skillet. Fill up about 4 cm (about 1. 5 inches) deep of oil in a pan. The oil can be reused after passing through a wire mesh strainer or a cloth bag to catch any debris detached from the coating. Coat the chicken with the flour mix. Once the oil is sufficiently hot, place the chicken into the pan. It will take between eight to thirteen minutes to deep fry the chicken depends on the size of the chicken. Use a lower temperature (160°C/320°F) for the larger pieces and (180°C/350°F) for the smaller pieces. Move the drumsticks slightly at the initial stage to prevent them from sticking. They will not stick anymore once the crust starts to set after a few minutes. You still need to turn over the chicken occasionally as the depth of the oil is relatively shallower than the deep fryer. Once the chicken pieces turn golden brown, remove from the oil and drain on a kitchen towel. Malaysia is a multidisciplinary society with highly diverse food culture. 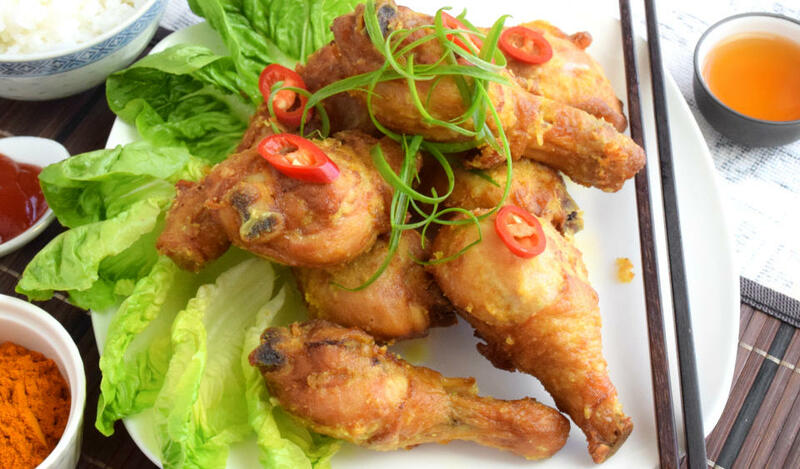 This quick and easy fried chicken recipe showcase how the local chefs creatively crafted this innovative recipe by combining the Malay and Chinese spices. 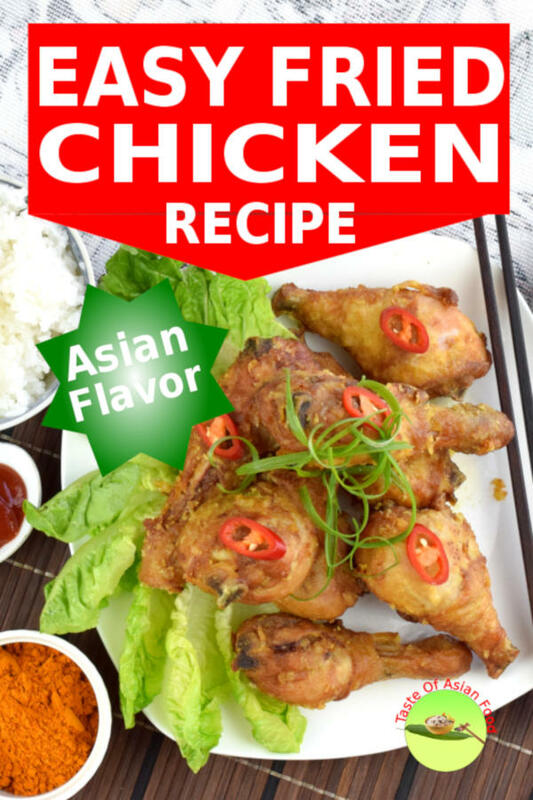 This easy chicken recipe with an Asian twist offers an exciting alternative to the typical fast food style fried chicken. It has a crispy coating on the surface, encasing the tender meat with strong savory flavor as a result of the overnight marination. Now it is your turn to try out the recipe. Do let me know the outcome by leaving your comments below. This video will show you how to prepare the Malaysian style Tomato Rice. (4.08 minutes). It is located below the Instruction, above the nutrition value in the recipe below. Clean the chicken pieces and make it dry by draining away the water or pat dry. Combine all the ingredients in (A) to marinate the chicken Let it marinate for at least one hour or better overnight if time is allowed. Combine all the ingredients in (B), set aside. Fill up about 4 cm (about 1. 5 inches) deep of oil in a pan. Deep-fried the chicken until golden brown. It will take between eight to thirteen minutes depends on the size of the chicken. Turn over the chicken occasionally for even cooking. 1 Response to "Easy fried chicken recipe (Asian flavor)"